Ever had your phone die out of nowhere? Maybe you were just about to catch a legendary on Pokémon Go, or maybe you were in the middle of nowhere and really needed those directions back home – either way, it’s beyond frustrating. Although batteries are nearly ubiquitous in modern technology, they still can’t charge themselves. But that’s where researchers from the University of Cambridge are shining a light onto new paths for battery technology: they’ve created a photo-rechargeable battery made of an organo-halide perovskite. More than just a solar cell connected to a battery, this is a single material that can both absorb sunlight and store its energy. By using a single active material, not only is the device smaller and less complex (making it easier to manufacture), but loss of efficiency due to transporting electricity is minimized. Organic halide perovskites are crystals composed of two different types of cation (positively charged ion) and one type of anion (negatively charged ion), arranged in a crystal lattice so that the charges are balanced. The name comes from the type of ion involved: organic refers to the organic cation, while halide refers to the Group 17 (F, Cl, Br, I) ions employed. The second cation is a metal, generally lead. When perovskites are exposed to light, some of their electrons are excited to a higher energy state. These electrons, when excited, leave behind a positive charge at a lower energy state. This positive charge is also called a hole. The oppositely-charged electron and hole formed by light absorption are attracted to each other, forming a bound state called an exciton. The electrons bound in the exciton can be separated, creating a source of electrical current and your basic solar cell. Figure 1. Organic lead halide perovskite (2D) of the type used to create photo-rechargeable batteries. Material is stratified into organic and inorganic layers. Reprinted (adapted) with permission from Ahmad et al., Nano Lett., 2018, Article ASAP (DOI: 10.1021/acs.nanolett.7b05153). Copyright 2018 American Chemical Society. Certain types of perovskites, like those used to create the photo-rechargeable battery, can self-assemble into layers of organic and inorganic components (Figure 1). This forms what’s called a 2D perovskite. Because these are generally more stable than 3D perovskites (Figure 2) – which do not segregate into organic and inorganic layers, but form a crystal lattice – they make a better material for batteries. The perovskites used for these devices also include some additives that make it easier for electrons to move around in the layer; these additives are reduced graphene oxide and a polymer binder. Figure 2. Methylammonium lead halide perovskite (3D); purple spheres represent halide ions, center contains the methylammonium cation, and the lead cations are centered in each green tetrahedron. Reprinted (adapted) with permission from Eames et al., Nature Comm., 2015, 6, 7497. 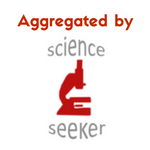 Copyright 2015 Springer Nature. To both capture sunlight and store it, the authors layered different materials to “architecture” their device. The 2D perovskite is sandwiched between a transparent conductive layer (fluorine-doped tin oxide or FTO) and a glass separator. A lithium metal layer finishes off the device (Figure 3); then the top and bottom layers are connected by electrodes. Figure 3. Diagram of solar charging (left) and discharging (right) of perovskite battery. Reprinted (adapted) with permission from Ahmad et al., Nano Lett., 2018, Article ASAP (DOI: 10.1021/acs.nanolett.7b05153). Copyright 2018 American Chemical Society. 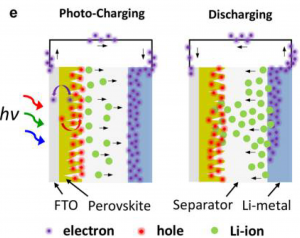 When the device is exposed to light (“Photo-charging” in Figure 3), electrons are generated in the perovskite material, travel to the FTO layer, and are transported to the lithium metal side of the device. This results in a positively-charged perovskite layer and a negatively-charged lithium metal layer. Lithium ions are positively charged (Li+), so they move across the separator to the lithium metal side – balancing all the negatively-charged electrons. When the battery is discharged, electrons flow out of the lithium-metal side and are used to do work; meanwhile, positively-charged lithium ions flow towards the perovskite layer once more. The cycle can be repeated to recharge the battery. 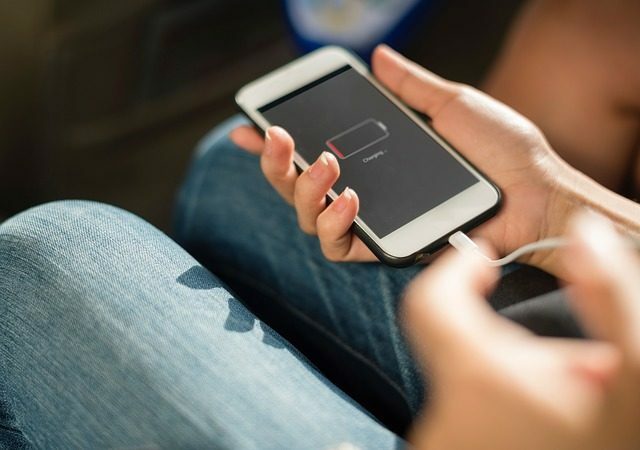 Unfortunately, there’s at least one reason you won’t be seeing perovskite photo-rechargeable batteries in your phone just yet. The stability of the system is too poor – after a few charge-discharge cycles, the battery’s capacity drops by 80%! Research into further improvements is ongoing, so one day soon you may see self-charging perovskite batteries powering anything from your off-the-grid house to your smart car.